Photographs taken for a styling of a 90s silk dress trend. Implemented into magazine-style pages. Emphasis on styling the nightwear out. 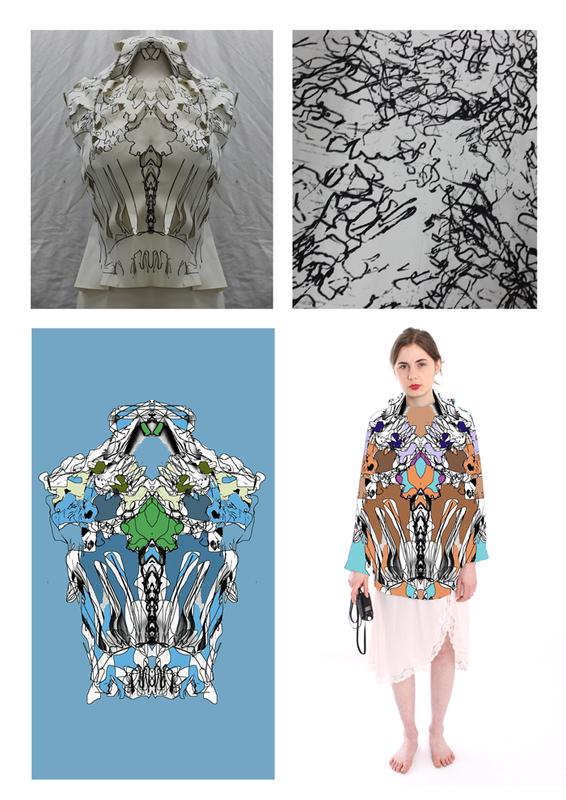 Screen prints along the first 2 rows (model monoprinted using dress from Carolina Herreras S/S 2016 collection). Screens developed from space themed drawings. Last image is an abstract monoprint. Work from a fashion experimentation week including changing objects (eg painting bark white or cutting up a milk bottle). 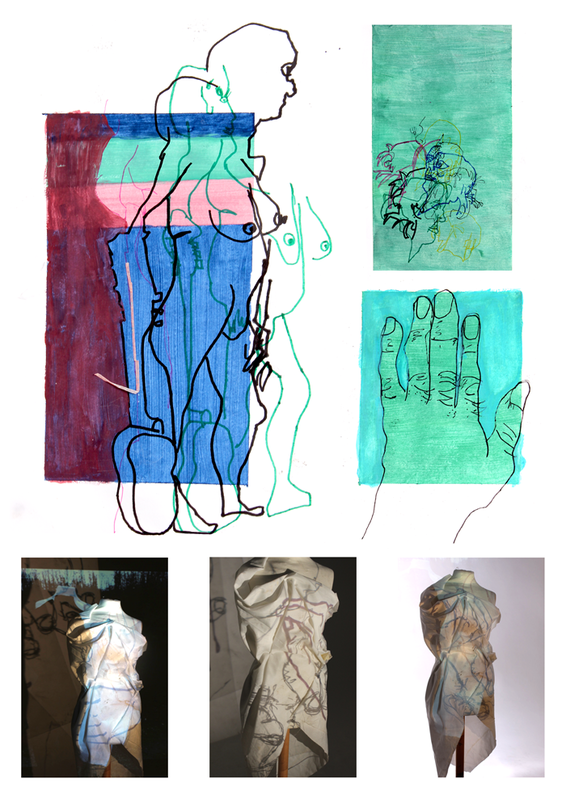 Images of their usage on a mannequin and pages of sketchbook. Demonstration of the development process of a space ship chalk drawing. Enlarged onto newsprint to work on the mannequin. 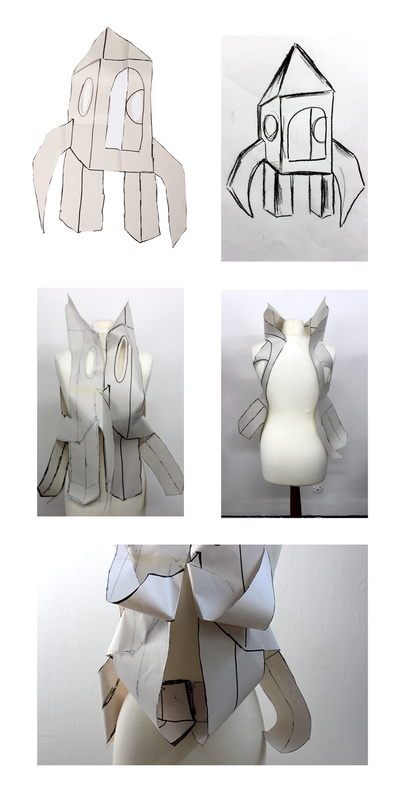 Demonstration of the process of making 3D-like garments using newsprint pinned precisely on a mannequin as the starting point. Developed on Photoshop to create illustrative like images and demonstated on a human form to give a better perception of its usage. Image created using newsprint manipulated on a mannequin, which is then changed in Photoshop to create an illustrative-like garment. 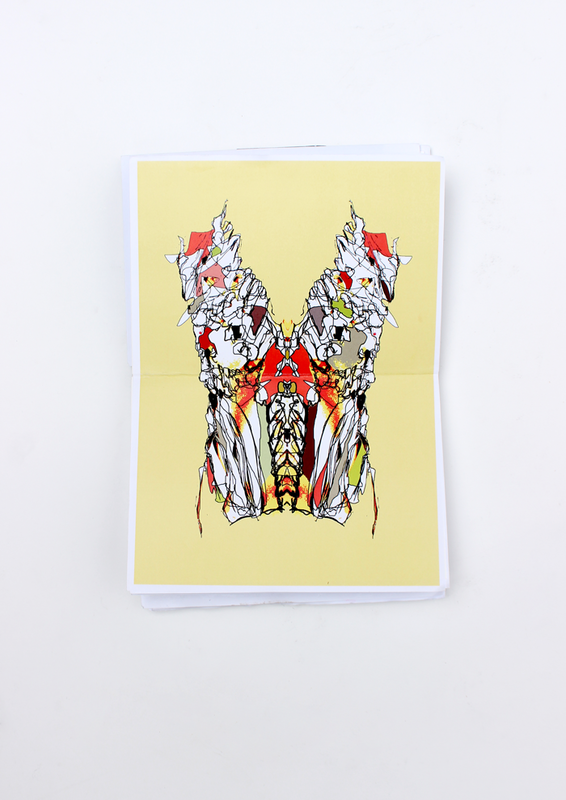 Images of garments developed further creating patterns using mirroring and flipping using Photoshop. 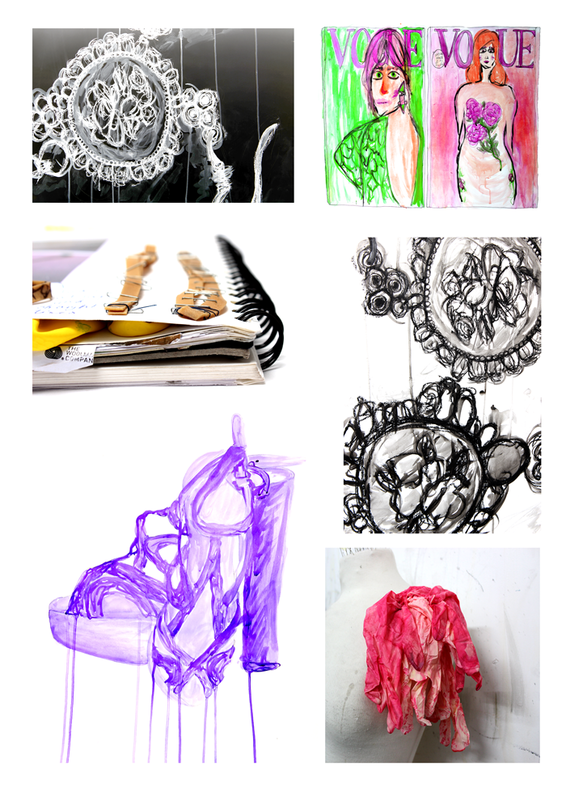 A collection of large-scale drawings of objects including magazines, earrings and shoes using ink and charcoal. 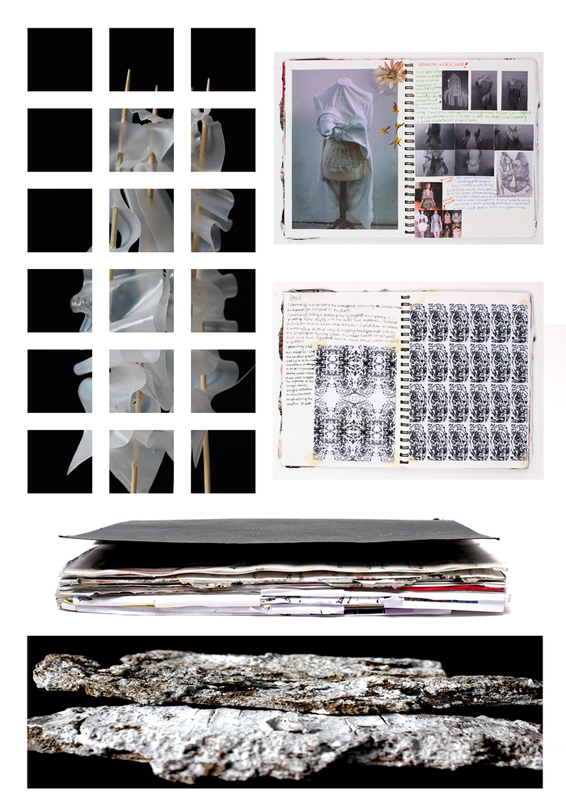 Image of sketchbook featuring manipulated elastic bands using staples. Image of dyed latex gloves pinned on a mannequin to create a shoulder piece. A series of continuous line life drawings focusing on the whole body and the head. A drawing of a hand which leads to the development of projecting hands on a mannequin. 3D Life drawing images. 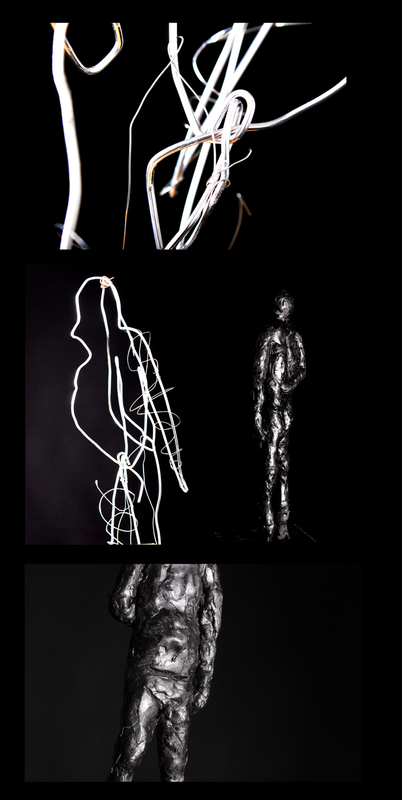 A series of sculptures created by wire and wax focusing on the human form. 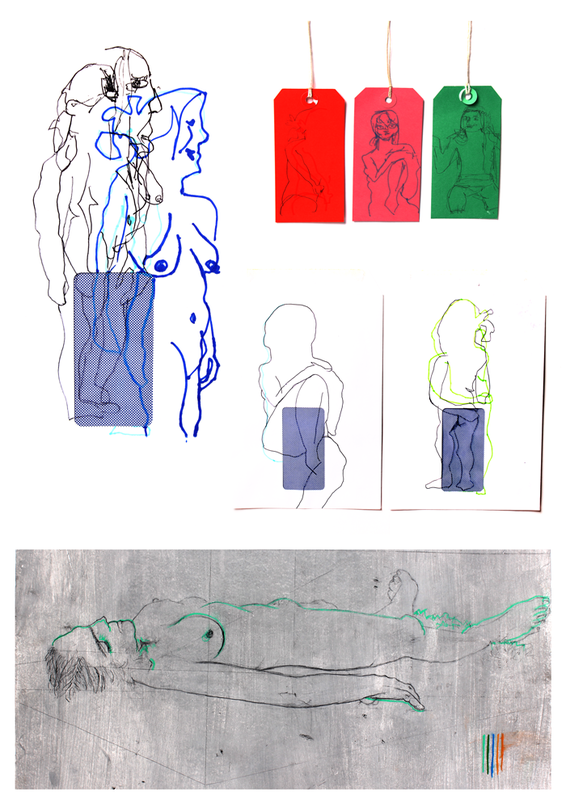 A series of no looking continuous line drawings focusing on the human body using a variety of felt pens and biros. Drawings made on tags and envelopes to show variety of surfaces. Lastly a study of foreshortening looking at perception and reality using HB pencils.